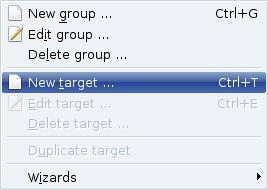 This short tutorial will show you how to configure your first target. Areca will need a directory where it will store the configuration of your backups (what files to backup, where to store them, which files types must be filtered, whether the backups are compressed or encrypted, and so on). This "configuration directory" is called a "workspace". In this tutorial, I assume that your workspace is "/home/olivier/areca_workspace". 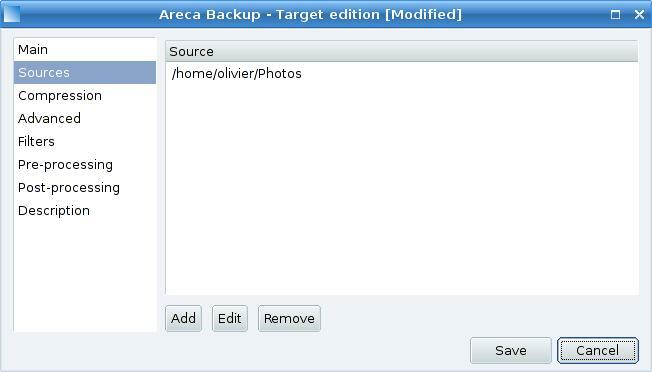 Areca will also need a directory (on your local hard drive or a USB drive, for instance) where to store your archives. This directory will be refered as "Backup directory". I assume in this tutorial that your backup directory is "/backups". 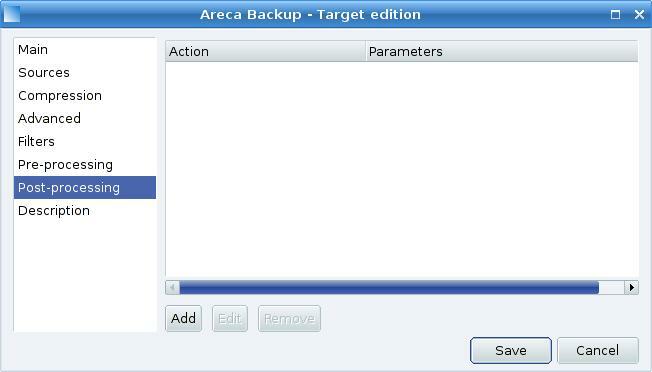 This is the main interface of Areca Backup. 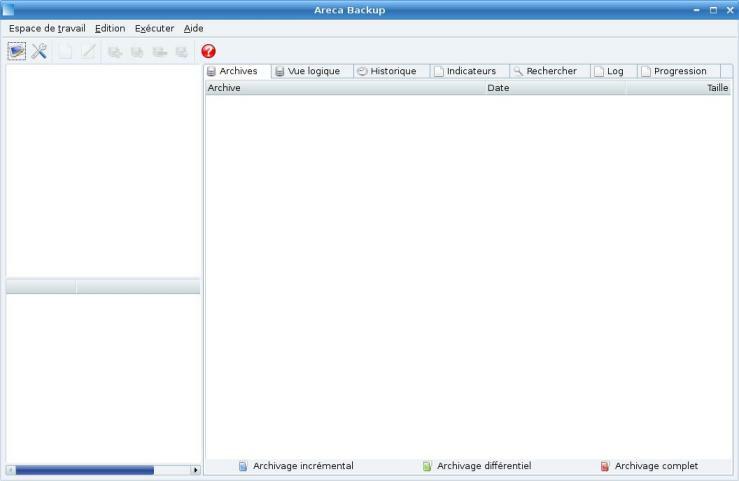 As said before, we want to store our configuration in "/home/olivier/areca_workspace", so go to the "Workspace" menu, choose "Open Workspace" and select "/home/olivier/areca_workspace". 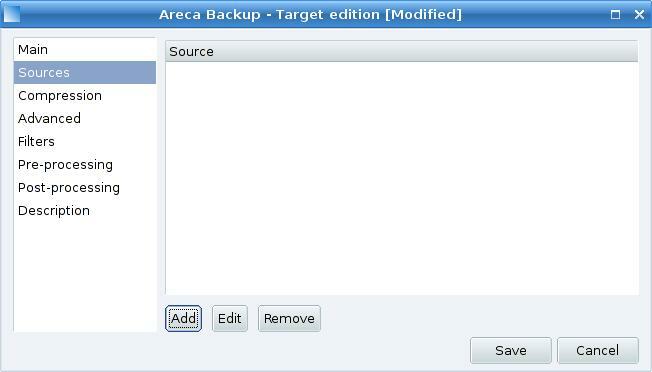 You can create multiple backup configurations in Areca. For instance you can create a first configuration that backups your MP3 without compression, and another one that backups your documents with compression and encryption. 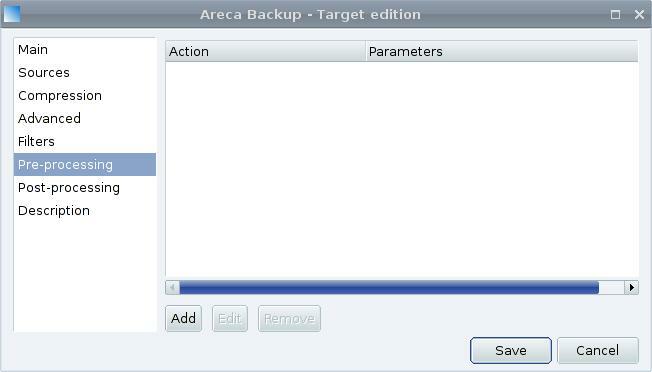 Areca allows you to group your configurations so they will be easier to manage. 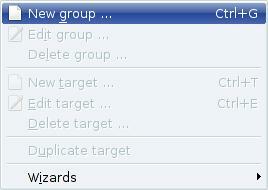 To create your first group, go to the "Edit" menu and select "New Group". A new window will appear, asking for a group name and description. 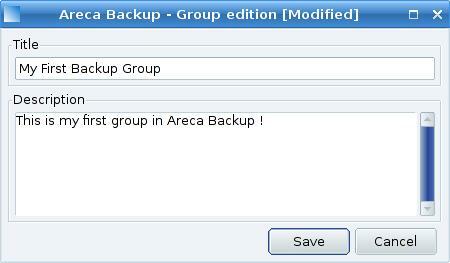 Enter "My First Backup Group" as group name. ... and click the "Save" button. 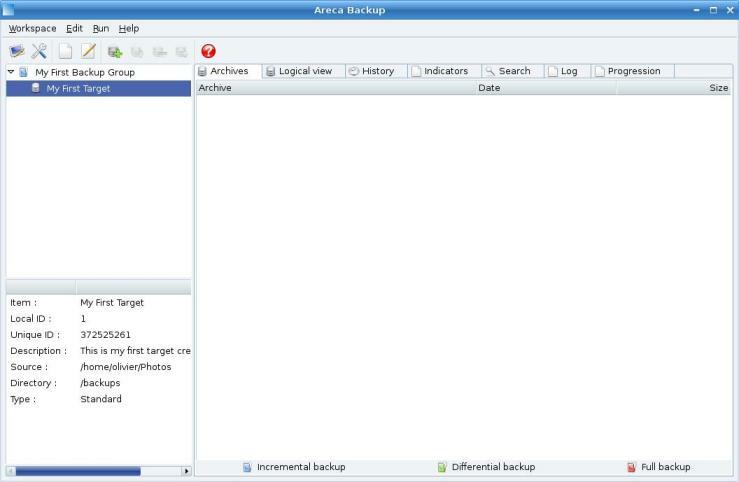 Enter "My First Target" as target name, and select your backup directory (which will be - as discussed at the beginning of this tutorial - "/backups"). 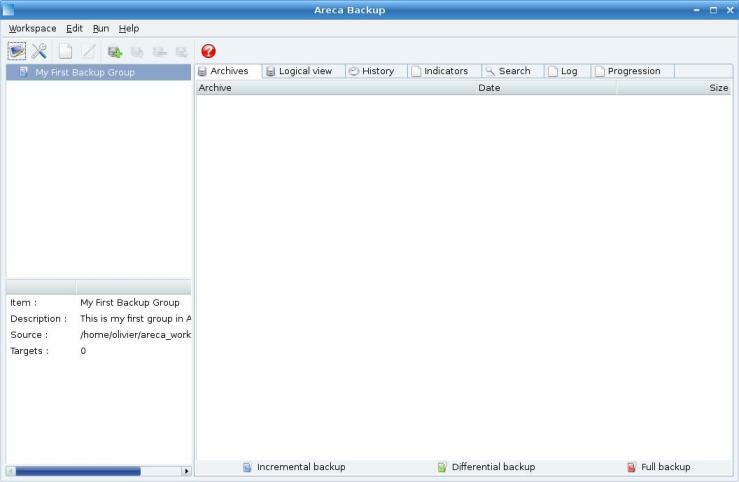 This tab allows you to select the directories you want to backup. Add as many source directories as you want, and go to the "Compression" tab. This window allows you to select whether your archive will be compressed or not (and how it will be compressed). In our case, we just want to create standard zip files, so keep the default settings, and simply check the "add .zip extension to filenames" checkbox. This window allows you to choose advanced parameters such as permission management (on Linux) or encryption. In our case, we don't want encryption, so keep the default configuration and go to the "filters" tab. Filters allow you to exclude unwanted files or directories from your backup. 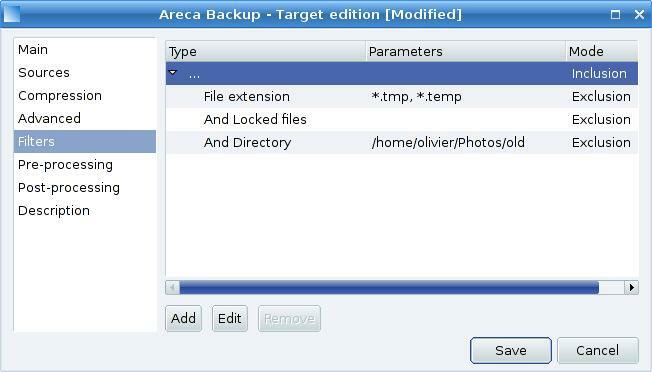 By default, Areca excludes "*.tmp" and "*.temp" files as well as locked files. Select "Directory filter" as filter type, choose "/home/olivier/Photos/old" as directory and click the "Save" button. Go to the "pre-processing" tab. 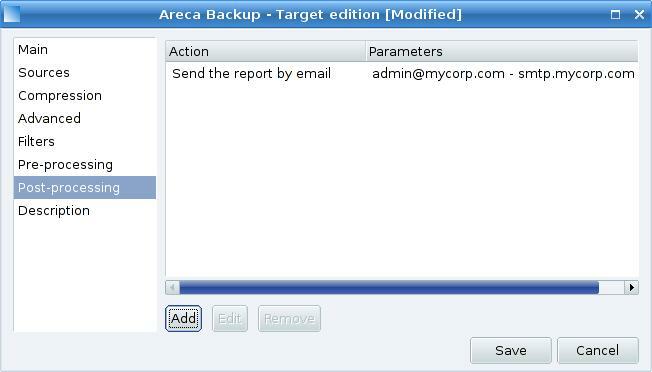 This tab allows you to define tasks that will be performed by Areca before each Backup. We don't want any pre-processing, so go directly to the "post-processing" tab. 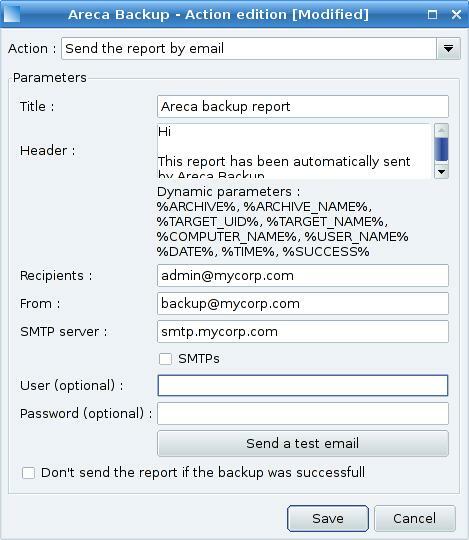 We want Areca to send an email to "admin@mycorp.com", using the SMTP server "smtp.mycorp.com" after each backup. To do that, click the "Add" button, and select "Send the report by email". Go to the "Description" tab. Enter whatever you want : it's just for information purpose. Once you're done, hit the "Save" button. That's it ! 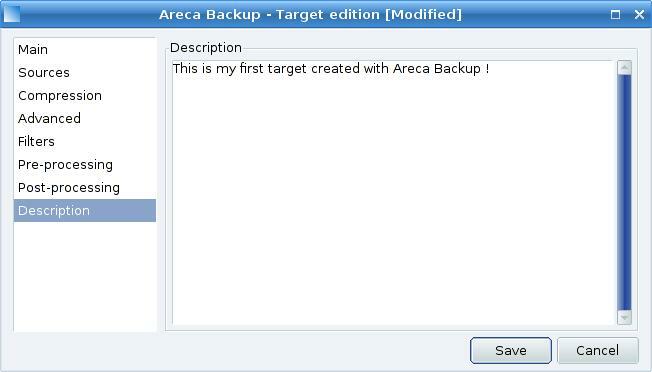 You've created your first target with Areca Backup !